Given the current climate, this is, at least in part, an album that resonates by painting a picture of a broken, divided world which is conflicted and uncertain. 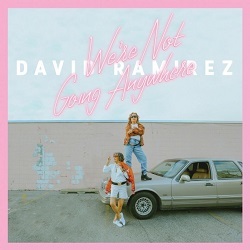 David Ramirez is a clever fellow though and approaches the task at hand by distilling the hurts of modern America into a series of songs that tell its story through 10 songs that re-imagine recent history, dysfunction and dissatisfaction as though they are the defining attributes of a relationship that’s falling apart. Indeed there are some bewildering truths buried in this record that are chilling and desperate. Where the songs are stunning, they are really stunning – Telephone Lovers (not quite as it sounds, it isn’t seedy) is heartbreaking, all cracked vocals and waning pedal steel, Twins and Villain make much of spacious ambiance, building intensity and deconstructed electric guitar to captivating effect, and the sparse, piano-driven, partly whispered title track, one of a few more straightforward songs on the album, is stark in its defiance. What sets this aside from previous outings, however, is that throughout, Ramirez’s deep, emphatic, deadpan vocal delivery and rootsy songwriting is a counterpoint to a wash of motoric drums and reverb drenched synths. Although Ramirez is heading into new territory by his own standards, this is relatively familiar turf for anyone that has enjoyed the more sublime moments offered by Springsteen or a slew of new artists like John Mark McMillan. For Ramirez, it’s an approach that consumes the songwriting on the album and doubtlessly won’t be to everyone’s taste, but then what is. More often than not, noting the change of creative direction, the album works out well, with strong songs carrying the can for questionable production and vice versa (People Call Who They Wanna Talk To being a prime case in point – who decided the ‘plinky plonky’ synthetic piano refrain was a good idea!?). Elsewhere, there are songs that just about miss the mark, employing some of the most beautiful ideas in equal measure with highly questionable decision-making – Time, for example, more or less rips your heart out as it describes that most frustrating conundrum of contemporary life, but just as you think you might get an answer to the age old question of ‘how do I fit it all in before I drop dead’, the sincerity and reflective tone takes a nosedive as, three minutes in, we are left with several ladies singing the lyric “Tick Tock…” repeatedly. Stone Age goes even further and is simply a song just best avoided. Dark, stark and unlikely to have anyone dancing, “We’re Not Going Anywhere” is oddly compelling. Aside from a few moments of horror, on the whole this is a thought-provoking, emotive record which very cleverly plays with the concept of how an artist can communicate ideas to their audience.